We now present Abe Lincoln the sequal. 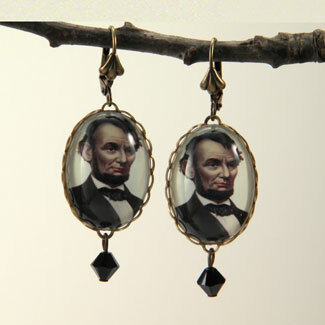 Due to popular demand we present the Abe Lincoln Earrings. This set represents your best patriotic sense of style.Protected by a magnifying cabochon, they measure18x25mm. There is a vintage black faceted crystal hanging from the bottom for an extra something special. Earring hooks have a hinge closure to ensure a secure hold, just in case you decide to dance the night away.